So about Sunday ... the double feature was devoted to John Garfield. I’ve seen The Postman Always Rings Twice a time or three, and I watched He Ran All the Way not all that long ago – and didn’t particularly care for it. (Great opening 20 minutes, but it gets very stagy very quickly.) Consequently, I chose to forego them both and dine with the czar instead. But I was on hand to sell merch and hear Eddie’s introduction, which touched on how the former Julius Garfinkle spearheaded the Group Theater-born school of naturalistic acting that prefigured Clift, Brando and Newman; Postman’s transformation from the definitive work of noir fiction to high-class women’s picture; and the blacklist’s effect on the careers of everyone involved with He Ran All the Way. When Eddie wrapped up by noting that he’s in regular contact with Garfield’s daughter and she asked him to tell the audience, “Julie sends his love,” I almost regretted my decision. I’ll revisit Postman again soon. Monday’s movies? Both brand new to me. 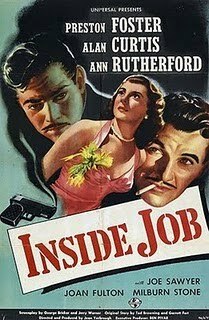 The authentic B picture Inside Job was aptly described by Eddie as “67 minutes of craziness.” Ex-con Alan Curtis, coerced by his old boss into robbing the department store where he’s working a straight gig, opts to hit the joint himself with wife Ann Rutherford. Sounds noir, right? Well, it ain’t. I don’t know what to call Inside Job other than baffling. Featuring a photo of a Robert Benchley lookalike in a bathing suit and the most annoying child actor in screen history. Curtis is the target of a police dragnet, but when he goes out in broad daylight – to buy a radio, yet – he doesn’t bother to shave off his distinctive mustache. Which I can understand; without the ‘stache, even the camera wouldn’t notice him. The truly downbeat ending makes it the weirdest Christmas movie ever. Tod Browning is credited with the story, the last time the legendary horror director’s name appeared on a film. It was unfair of Eddie to show a Fritz Lang movie next. The opening sequence of Human Desire, showing train engineers at work, is more suspenseful than all of Inside Job ... and nothing is happening. The film is based on Émile Zola’s 1890 novel La Bête Humaine, previously filmed by Jean Renoir in 1938. Glenn Ford, an actor Noir City has taught me to appreciate, is a Korean war vet returning to his railway job. He falls for the wife of colleague Broderick Crawford, unaware that her interest in him is spurred by the need to cover up a murder Crawford has committed. Human Desire is another showcase for Gloria Grahame and her stiletto vulnerability. The psychology of her character is so dark that the movie itself seems frightened of it. The beautiful quality of the print only emphasized the truncated scenes and abrupt ending. For its occasional skittishness, however, Human Desire has intensity and atmosphere to spare. From Fritz Lang, I would expect no less.